Jeffrey Steele & Friends ON SALE! Jeffrey Steele has signed on for another year at the 30A Songwriters Festival the weekend of January 18-20. The 30A SONGWRITERS FESTIVAL is a three-day music festival featuring more than 125 songwriters and over 200 performances in venues ranging from intimate listening rooms to spacious outdoor amphitheaters amid a backdrop of brilliant white sand beaches and turquoise waters along scenic Highway 30A in Northwest Florida. For more information and constant updates, please visit the website http://www.30asongwritersfestival.com/, to get tickets click HERE. Don’t forget to download the FREE 30ASWF app for iPhones and Android phones today! Jeffrey Steele and his band will be playing the Seafood and Music Festival at Capt. Anderson’s Marina down in Panama City Beach October 27th. The FREE festival runs from October 24th – 28th. For info on VIP tickets and more about the event go HERE. Check out the Calendar for new LIVE dates added! Including two dates in Middle Tennessee. Country rapper Colt Ford’s latest record Declaration of Independence is out now and it includes the track “It’s All” written by Colt Ford and Jeffrey Steele. The song also features backing vocals by Jeffrey Steele. Read more about Declaration of Independence and get yourself a copy HERE. Keep your ears open for new Jeffrey Steele songs on the radio! Craig Morgan’s latest “Corn Star” was written by Steele & Shane Minor and Heidi Newfields “Why’d You Have To Be So Good” was written by Steele & Jeremy Popoff. Also be sure to check out The Cadillac Blacks debut release which includes “Turn It On” written by Steele and lead-singer Jaren Johnston. Jeffrey Steele tickets on sale! 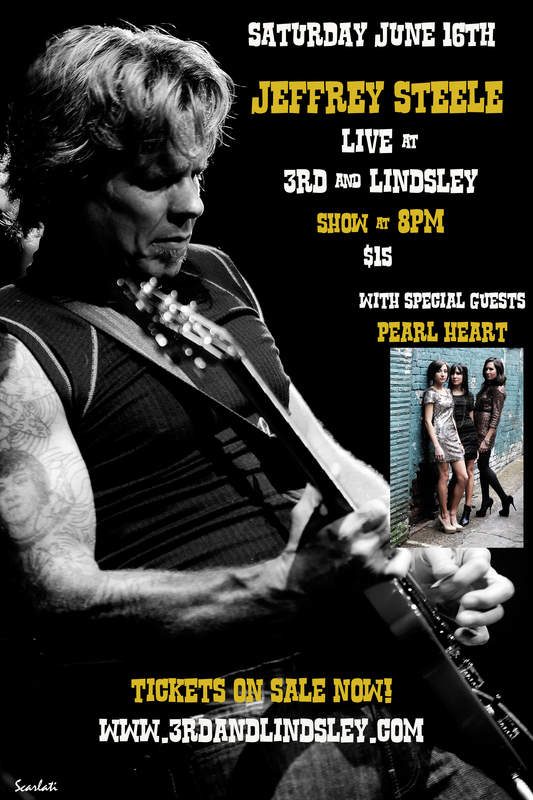 Tickets are on sale now for Jeffrey Steele LIVE at 3rd & Lindsley June 16th! Doors open at 6pm and the show starts at 8pm. Come out for a night of great music! Be sure to watch GAC’s Headline Country hosted by Storme Warren this Thursday May 10th at 9pm EST. This weeks show will feature some footage from the March Jeffrey Steele & Friends event!